This is a wonderful Mediterranean whole wheat couscous salad filled with artichoke hearts, bell peppers, tomatoes, chickpeas, fresh basil, and topped with roasted sunflower seeds! It is perfect on a hot summer day, both because it is so refreshingly delicious but also because it requires no cooking at all! 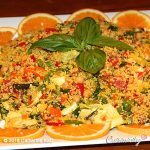 The couscous is raw and just absorbs all the wonderful flavors of the citrus dressing so that it is perfectly fluffy and not clumpy. This vegan salad makes for a complete meal! It keeps beautifully in the fridge so you can have it for lunch the next day and the next day…!! The couscous will expand once it absorbs the citrus dressing so don't use any more than 1 cup dry!!! Place all the dressing ingredients in a small bowl and whisk to blend well. Place the dry couscous in a large bowl, pour the dressing over it and stir well once; set it aside, uncovered and do not stir again for 10 minutes. Place all the remaining ingredients on top of the couscous and gently stir (after the 10 minutes are up!). Sprinkle with the sunflower seeds and serve either at room temperature or cold. Watch this 10 second video clip of the final stirring of all the ingredients… So enticing isn’t it?! Ce couscous est simple à faire et délicieux. Merci de partager avec nous vos bonnes recettes . This is one of my favorite recipes and I make it often. Tomorrow I am bringing it to a picnic, celebrating my brother’s 70th birthday. He loves spicy– what are your thoughts about adding a pinch of red pepper flakes? Catherine , another award winning recipes of yours!!! Made it tonight for my work Christmas lunch tomorrow. It tastes amazing! I modified it a little. I added 2/3 cup orange juice, juice of 2 limes, and mixed nuts/ pistachio, almonds, pine nuts and pumpkin seeds . I pan roasted the nuts in a little lemon infused EVOO, sprinkle of cane pepper, cinnamon, and saffron. I’m Persian so tried to give it a bit of Persian twist. Also added some orange zest to the salad. Thanks so much for creating all of these tasty, and nutritious recipes with lot of love! Delicious, Catherine! Loved the blend of flavors and healthful ingredients. Perfect summer dinner in temporary housing with non existing kitchen ? I just finished making this salad. Put it in fridge for a couple hours for flavors to blend and then will pig out on it. Your right, it does make a lot!! Do you think it will freeze ok? I am so happy to hear that Sharon!!! I can’t say I have ever tried to freeze this salad but I don’t think it would freeze well! On our wooden swing of course and it is a million hearts for rating! It is the most glorious spring day and my husbands birthday down here in the South. This was the perfect birthday picnic lunch. We all ate it outside in the sun below a tree with its glorious new leafs on our wood spring in the sun. Just the perfect lunch with the perfect salad. Definitely a million hearts, because as with most of your recipes it is also ridiculously easy and fast to make. AND I can pack the rest in our lunch packs next week (if no one inhales it as a snack over the weekend, which also entirely possible, since it is so yummy). Cathrine, I have never seen whole wheat couscous, but love taboule. I used to eat the not so healthy version a lot during my graduate studies @ ECPM de Strasbourg. Where do you find whole wheat couscous and what brands do you recommend ? … Found whole wheat couscous @ nuts.com and put it on my next auto delivery order along with some Bulgur. I see you found the whole wheat couscous, but I just typically find mine in bulk at the health food store, so I don’t have a particular brand. Just curious–Are you currently in the US? Yes, down in Texas. That means I am late in planting out my tomatoes this weekend in the garden. Currently it is producing kale, collards & mustard greens. So your interchangeable greens blog came in handy. Also eating sugar snap peas and radish from the garden. We tried this recipe, and it’s wonderful. However, my wife dislikes artichokes (more for me!!). Any suggestions on what I might use as a substitute so I don’t loose the balance of flavors and textures? Haha Tom, You got me there! I really can’t think of something similar but really, it would be fine to omit them and just add a couple more tomatoes, to make sure it is plenty moist. I think it will still be delicious! Thanks for your kind words, I always love to hear! As a fellow graduate of Ramapo Sr High School and a good friend of David Katz it is wonderful to see how his career has blossomed…and you look like the perfect spouse for my friend. And each one of your kids is beautiful! I have been following Dr Fuhrman’s Eat to LIve principles and am getting heartily sick of green salads…I am thrilled to find that your salads and the recipes here largely follow the same guidelines and you actually have some easy, tasty and best of all : healthy salad recipes. I look forward to explore this website and finding even more yummilicious recipes. Hi Cynthia, avocado is absolutely wonderful nutritionally but I think it may be too thick, even mixed with the balsamic vinegar to give the couscous the moisture it needs. I love using extra virgin olive oil, both nutritionally and taste-wise so I can’t really answer your question. Still I would love to know how you make out with your healthy substitution. I have some fresh squeezed grapefruit juice in the fridge….maybe I will add a half cup of that. It’s pretty sweet so I do not think it will be too bitter. hi Cynthia! I would love to know how you did without the olive oil. Did you enjoy it with the grapefruit substitution? I am making the salad today. But I have a question. I have some large size couscous….Do you think that will soak up enough liquid to be palatable? Should I add more liquid? If by large, you mean the Israeli pearl couscous, The answer is no, it won’t soak it up, but if you just use larger size couscous it will be fine! That’s wonderful Cynthia! I love your determination, and delighted that it paid off–Good for you!! Oh my goodness, Cynthia, that’s wonderful! I just forwarded your e-mail to David. He’ll love to hear from you! Thank you for your kind words, you are delightful, I am so happy to welcome you to our cuisinicity kitchen! Catherine! I am so glad to have found your website:) I just finished listening to Dr. David on a podcast and happened upon your site. I am excited to try your recipes. I am an interior designer, but cooking and food and health are part of my makeup! I just wanted to say thank you for putting time into your site for those of us who are trying to make a difference in our family and friends’ well being. Best to you and yours!! Thank you so much Nina! What a lovely thing to say!Part of your make-up, is such a wonderful way to put it! I look forward to your trying my recipes! Enjoy! You are so sweet Debby! But it’s not because the quinoa was red, but because you used quinoa in the first place!! Quinoa indeed requires pre-cooking (see my Simply quinoa recipe: http://cuisinicity.com/simply-quinoa/). 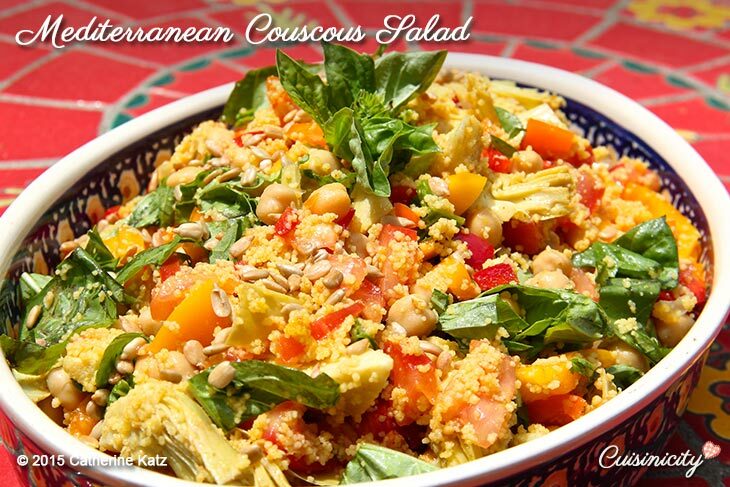 I use whole wheat couscous which works beautifully with no cooking for this salad. Please don’t give up, and try whole wheat couscous next time, I promise it will work perfectly!! I love these salad ideas for summer! I work every day so it’s nice to have these recipes to make ahead and store in individual size containers to take with me. I made this salad today and it looks delicious! Delighted to hear that Wendy!